Order - Destroy this event to begin combat involving your Bajoran Resistance personnel. 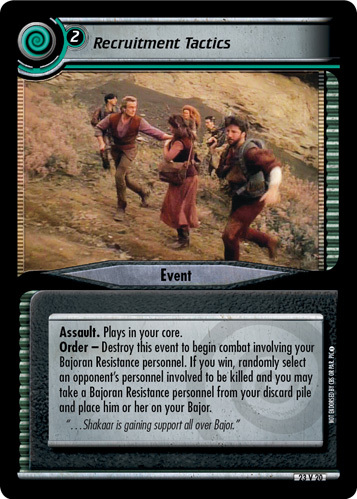 If you win, randomly select an opponent’s personnel involved to be killed and you may take a Bajoran Resistance personnel from your discard pile and place him or her on your Bajor. "... Shakaar is gaining support all over Bajor." Characteristics: "relocate" personnel cards - form discard pile into play, combat, kill opponent's personnel, plays in your core, recover cards from your discard pile, Assault. This card has an erratum: Clarification, which personnel could be selected. Game text without errata: "(...) If you win, randomly select an opponent's personnel to be killed and you may take a Bajoran Resistance (...)".